AP Newswire (Allen, Texas) The mighty Allen Peanuts (2-0) extended their Fall 2014 wining streak in style Thursday against a winless Riptide team ( (0-2). The convincing 19-9 victory is “just what the team needed” according to Coach Matt Tenner, commenting via cell phone from outside a local bar in Lubbock, Texas. As usual, Coach Tenner contributed to the Nuts victory with solid play in center field, and a couple of nice base hits. Most importantly, Tenner won the second of two coin tosses this season (currently 2 for 2, a Nuts team record). Damage done, the Nuts returned to the dugout determined to answer — and answer they did, batting around and scoring 8 runs, including a grand slam from Chris Baker (RCF). “I could see the wind was blowing out and that the bases were loaded, so I swung for the fence” said the pumped-up center fielder in the dugout immediately after the blast. “The wind did the rest.” While the wind did blow wildly throughout the remainder of the game, Baker’s dinger was the only one of the contest. The Nuts would go on to score a total of 18 unanswered runs in the game on the strength of solid defensive play, particularly in the outfield. Nice catches by Haisler (4 for 4 on the evening) and Cole kept Riptide base runners in the dugout. In the infield, 3rd baseman Johnston had 2 single-handed putouts on grounders and a couple of nice throws to returning 1st baseman Rusty “Glove Buddy” Dubree. Shocking the media and fans alike was infielder Rick Saavedra, returning to the lineup at second base this week after his nasty experience last week at first. “Using your face to stop the ball is not recommended” quipped a clearly upbeat Saavedra. “I’m just glad that I lived to play another 9 innings.” Rick was 3 for 4 on the night, after being robbed by an amazing over-the-sholder highlight-reel catch by the Tide left fielder. Catcher Mason, unwilling to let opponents score without a fight, had another nifty play at the plate this week on a poorly hit ground ball. “I’m pretty sure it was actually foul” commented Mason, “but that’s why we play until the whistle blows”. Mason continues to struggle at the plate, going 1 for 3 on the evening. Johnston, Saavedra, Dubree and Nelson played exceptionally well as a unit the infield, combining for a total of 13 hits on the evening with no errors on defense. By way of punctuation, Nelson completed and excellent put-out at second to close out Riptide’s last at-bat and essentially end the game. 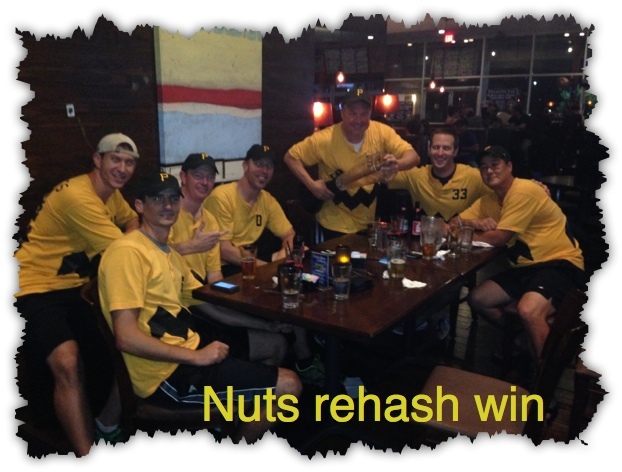 All in all, the Nuts are happy, off to a nice 2-0 start for the Fall season. In the post-game meeting, coach Cramer, commenting from Washington, D.C. via satellite, credits conservative play for the turnaround. “We have stopped trying to make plays that aren’t really there — and that makes all the difference. The boys did a great job [without me] tonight.” Hoping to extend their streak, The Peanuts play again on Thursday at 7:30PM when they face the winless Underdogs on Ford Fields #2 in Allen.